Who is ready to travel with these monsters? Top 10 Family Travel Needs! We have made a lot of good decisions while traveling, we have also made a lot of bad decisions. We have had a 4 year old with food poisoning on a 9 hour flight, we have had trips that ran completely with out a hitch. So far with all three kids we have flow around 200,000 miles. 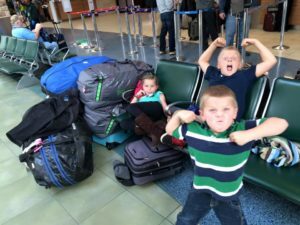 From that time spent in airports (current record was 3 full days in DFW), and long flight segments (26,000 miles round trip to Johannesburg South Africa) this is our current list of top 10 things a family traveling needs! We have been lucky to be personal friends with our general practitioner! He has always been game to the random text or pic of injuries, bug bites and maladies for some sage medical advice. WebMD is not your friend, real MD is! It has given us guidance not just before the trip (what shots, preventative medicine, and sundries are needed), but also we have many times texted or messaged pics of bug bites, bee stings, cuts, and injuries to ascertain if we need to go into a local hospital or if it can wait. Chat with your doc and see if they may be ok with the extra curricular communication (then don’t abuse the privilege by texting every little bug bite! This specifically is Tren’s must have. A small USB rechargeable fan. Having spent time in the tropics, deserts, and muggy cities its easy to sweat yourself dry, especially if your temp runs hot. For around $20 off Amazon you can get yourself this handy little fan that has about 90 minutes of stored power or can plug into any USB outlet to charge or work off power! They are quiet and can really make the difference when things get hot. For us the use of a premium credit card (one with a yearly fee over a few hundred dollars) has become a requirement for us. Traveling with 3 kids can get extremely expensive in airports. With even cheap food costing between $40-$60 per meal we have found the lounge access that comes with our American Express Platinum to be indispensable. 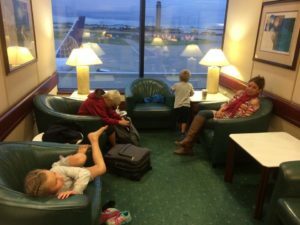 Being able to relax in a quiet lounge where the kids can eat and drink to their hearts content, and we can enjoy coffee or adult beverages makes the travel much easier. Even better is that in most of the lounges drinks are not the only things that are included. In most lounges you can find free Wifi, shower facilities, food, and in many there are great kids rooms. This allows a bit of quiet time for us while the kids play. We try very hard to be quiet while in the general lounge to be respectful to the other guests and the kids rooms give the kids an opportunity to make a bit more noise. We plan our travel to allow enough time during layovers to get a good meal in the lounge and rarely if ever purchase food in the airports any more. Most notably we traveled for 52 hours to Africa and did not make a single airport purchase (except some candy in DFW for the kids). Plan your trips to allow enough time to feed and water the kids! This was the second 12 hour stint in the Admirals Club as we flew standby to Chile a few years ago. We made it out the next night, but were able to feed the kids breakfast and lunch for three days for free. Ah the joys of a dead iPod. We allow our kids to bring on electronic item, and typically they bring their iPods. Even though most international flights have in-seat power and we spend a lot of time in airport lounges the kids invariably run their iPods dry (or Tren watches too many movies without power then cant use his phone to run the maps to get to our final destination. With that in mind we ALWAYS travel with a battery bank. Ours is the size of a wallet with 2 USB plugs and can refuel an iPod 6-8 times. It takes a while to recharge so we always make sure its full to start with. This one seems quite self evident but even as the kids get older we always travel with a change of clothes (for all the kids and adults). As the fun of bumps, spills, and wayward sodas never seems to end we always have a spare for each of us. Moreover when the fun of airsickness strikes (we had 9 hours of food poisoning with Merle and Isaac somehow managed to get sick while waiting to deplane in Doha, Qatar) having a spare for the kids AND adults can make all the difference since the kids seem to get it on them and us. It is always a great idea to research where you are going and make sure you have the appropriate outlet adapter. The “universal plugs” often do not cover some of the more random place you may travel. Noteworthy is both South Africa and Italy rarely come in the “universal” plugs. We always get one that includes USB plugs to make our plugging more efficient. For most electronics made today you do not need a “converter” those adapt the power from 220 to 110. Check your power adapter on your electronics and if it says 110-220 you are good to go. For the longest time we made do with random backpacks and the cheapest carry ons we could find until our last trip from Chile to Australia. We had one carry on get destroyed as checked baggage and had to replace it. We finally put down some good money and got a legit carry one bag, and have never looked back. Having a well thought out carry on that ACTUALLY fits in the sizer and can fit a load stuff can mean less checked baggage and more money saving! Our favorite is the Travelpro Maxlite 3! Think through your entire trip and make sure you have the proper medication for where you travel. We always travel with Tylenol for the kids and Tylenol and ibuprofen for the adults. Also we take some prescription drugs for stomach bugs, chest congestion, and ear/teeth infection. Lastly take Desitin (anti rash), hydrocortisone (anti-itch), antibiotic ointment, and some band-aids. Past that local preventative measures can be important (if your traveling to areas with malaria or some other preventable sickness. Lastly we always make sure the kids (and adults) are up to date on shots before we travel so we don’t get caught off guard for tetanus or hepatitis. This one still gets us from time to time. First thing we try to do in every new country is get to an ATM before or at the baggage carousel. This way you can get to an ATM while still in the security of the airport and we always get around $100 in local currency. We always pay with a credit card whenever possible when we travel but often toll roads, bathrooms stops, and some restaurants cant take the card. Having that spare local currency gets you off on the right foot and under the security blanket the airport provides (if you get it before you exit with your luggage). We don’t do the currency converters as typically you get a much better rate with less fees on an ATM. This means have a plan for your cell phone. A lot of carriers have international plans now that can be cost effective and keep you in communication with the world. We as a family have 2 cell phone providers. With our Verizon plan its $10 per day while we travel abroad and it functions the same as it would in the US. Meaning you can make and receive phone calls, texts, and use data like you would in the US with only the limits of your regular plan. We also have one phone that is on Sprints Unlimited plan and with that we get free international data roaming. It is throttled way back so surfing the web is slow, but it works great for messaging, maps, and texts. With Sprint you can pay $5 per day or $25 for a week of unlimited high speed connection while abroad. With that and FaceTime you can easily stay in contact. Our kids go to an online school and we are able to keep up hot spotting on the Sprint for the $5 high speed per day. Another solid option is to plan on getting a SIM card in your destination country and use that data plan instead of your home plan. We found in both Japan and New Zealand this gave us better options than the pay per day. This is also a good plan if you intend to stay in that country for more than 7 days as the daily fee can rack up. This is not an exhaustive list of what you need to travel but this seems to help us along! What is on your top 10 family travel need list?